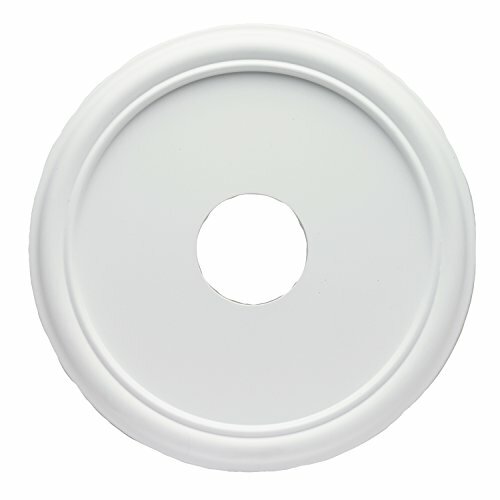 Create an attractive backdrop for a ceiling fan or fixture with this smooth white finish ceiling medallion. With a banded edge and smooth white surface, this medallion offers understated style that goes well with any decor. The simple installation of this medallion is a great way to hide a Hole if an opening in the ceiling is cut too large. It can also hide ceiling blemishes and cracks that may appear around ceiling fans and lighting fixtures. The medallion is 16 inches in diameter. It is made of durable molded plastic. Warning: to avoid the Risk of fire, all light bulbs or any heat generating source should be at least 6-inches from this medallion. Features. Simple, versatile design. Smooth white finish. Durable molded plastic construction recommended uses. Create a backdrop for ceiling fans and lighting fixtures. Use to cover too-large holes and cracks on ceiling dimensions. 1” height. 16” diameter. 4” center opening installation. Adhesive or additional hardware required. This product is manufactured in Taiwan.